We are happy to introduce our new service — SEMrush Sensor. What’s it for? Essentially it tracks the volatility of Google search results on a daily basis and makes you aware of it. Forewarned is forearmed, right? The sooner you have the right information, the faster you can react and adapt. It’s no secret that Google’s rankings are not constant and evolve fluidly. You may have noticed this by tracking your website’s position changes day by day, but sometimes you want to know “is it just me or is it everyone else too?” Don’t panic, stay on guard with SEMrush Sensor! You can find a link to the new service at the bottom of the SEMrush main menu. Once you have clicked on the Sensor tab, you’ll see a daily Sensor score indicating the current level of volatility of Google SERP. The higher the number, the more likely it is that Google’s Algorithm has undergone significant changes. Below the score you can see the SERP volatility trend for the last thirty days with attached notes, which will keep you informed of the most significant changes in Google’s ranking algorithm. 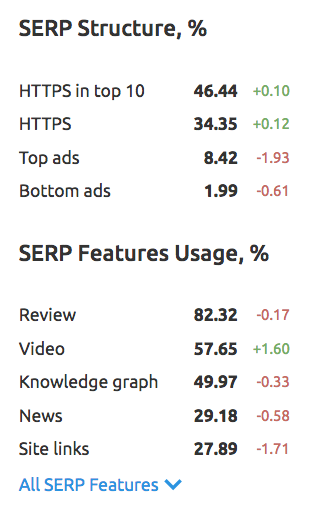 The Sensor’s key benefit is that you can track changes in Google’s rankings for particular industries in the Categories column on the left. You can see which categories have been affected the most by recent updates, and you can also track a specific category you're interested in. Another handy feature is the option to view the percentage of SERP features, ads and HTTPs usage in Google search results to have a broader picture of the SERP volatility. At the moment SEMrush Sensor only monitors US desktop and mobile databases. Let us know if there is a database you would like us to integrate into the tool at [email protected]. Since the Sensor is in open beta, your feedback is more than welcome!